Pet peeves, anyone? Some of mine are; prehistorically-slow internet connection, delayed flights, people with the audacity to lie repeatedly to your face and to themselves (and worse, think you're as stupid as them to believe their poor excuses), and Photoshop unexpectedly quitting every time I try to save (oh, the irony!). All of which happened in 24 hours, so needless to say I had to keep my blood pressure normal by indulging myself in a few of my favourite things. Good company, good food, and a good dress. 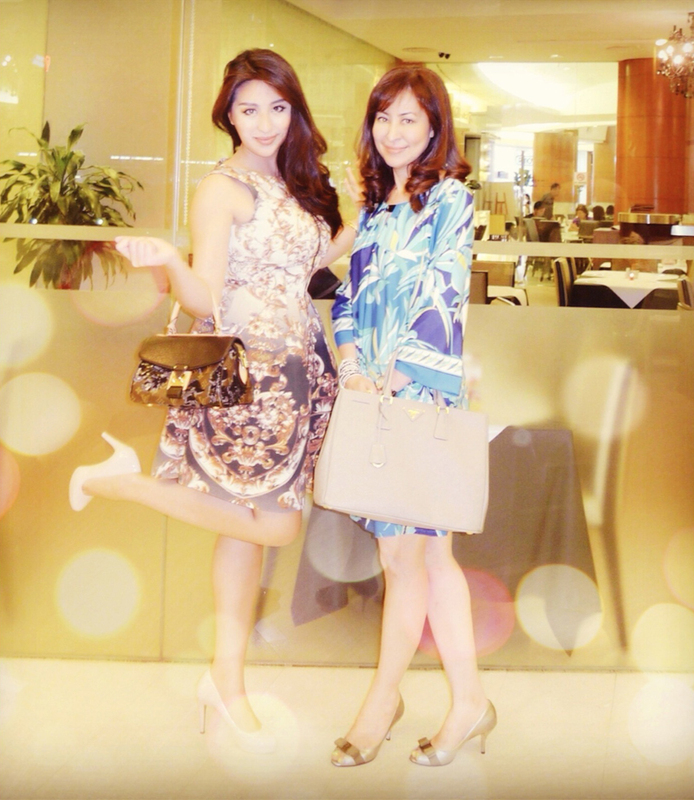 Louis Vuitton handbag (I forgot exactly what it's called) and dress, stolen appropriated from mummy's wardrobe. Last night mummy, my camera-shy brother, his new girlfriend, and I had dinner at one of my favourites in K.L, the ever low-key and unassuming but excellent Sage at The Gardens, Mid Valley. For starters, mummy had capellini pasta with trio of seafood and seven chilli pepper, lil brother had gruyere cheese souffle with cream bechamel sauce, and his girlfriend ML demonstrated good taste by ordering the same starter as me (haha), seared foie gras with dark grapes and red wine reduction. The foie gras melted on my tongue like a dream, the sweet dark grapes were the perfect foil to the richness of the liver, and the wine sauce was mopped up with pieces of bread. 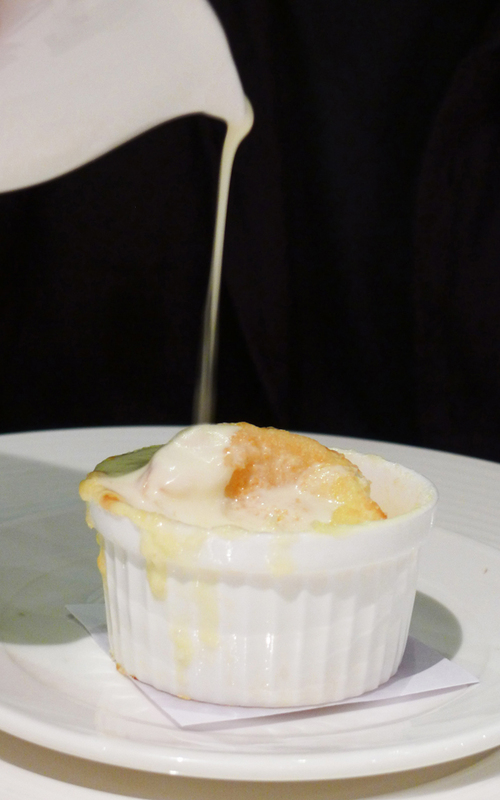 Brother drowning his creme souffle with bechamel sauce, just to be doubly sure it's dead. For mains, mummy had herb crusted halibut with rice wine and hakame broth and ML had the most fearsome looking lamb shank with provencale vegetables. 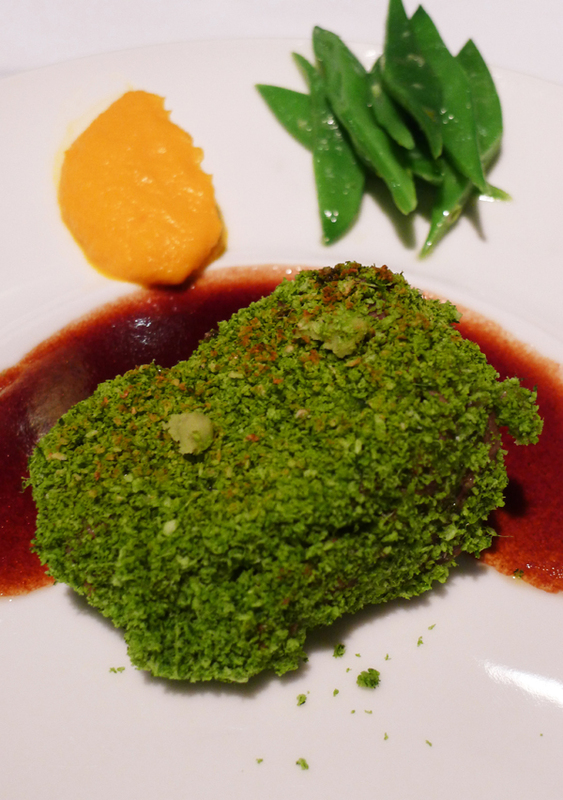 Brother and I both plumped for wasabi crusted wagyu cheek with a side of flat beans and carrot puree. It was of course divine. I won't bother insulting it by trying to describe the taste with meager words. Just do yourself a favour, go down to Sage and order it for yourself. The empty plate speaks for itself. For pudding I was slightly let-down by the wasabi souffle with milk ice-cream which tasted bland, like air that once dreamt of wasabi although the ice-cream was gloriously creamy. ML kept it simple with Earl Grey ice-cream, brother's ginger and lime creme brulee was deliciously fiery, and mummy found a winner in the ever dependable Belgian dark chocolate fondant with Earl Grey tea ice-cream. Dinner ended predictably with petit fours and tea, just how I like it to. I wanted a glass of champagne but mummy forbade it because I was the designated driver. Has one, just one, glass ever done anyone wrong? Sigh. Please tell her that. Sartorially speaking, I'm somewhat lazy and spend most of my time inadvertently dressed like an old lady (maxi skirts and unintentionally clashing prints will do that). Whatever energy I have is invested in drawing and bergolek-golek so when I do 'dress nice', attention must be paid. This doesn't happen often. I love that this dress is too tight in the chest, binding and minimizing my bust. Ironically when the zip is undone to just above my rib cage it has the opposite effect, creating the "Look ma, no hands!" corset effect that will no doubt set tongues wagging in speculation of the authenticity of my female assets. Heaven forbid I burden you with that. It's nearly midnight and I'm going to eat some durians in my room to annoy my mother (she hates the smell) and read Thick Face, Black Heart. Trust no b*tch, fear no man. Hahaa 'good company, good food, and a good dress!' I love the way you blog with such a fun and easy-going attitude! I'll remember that, and Happy birthday! haha, after reading your 'Turning 27' post, I must have missed that small nugget of information! 01. Having inheritance from parents. 02. Have a secure career to earn a livng. 05.For a male person: Having a faithful and virtuous wife. For a female person: Having a faithful and virtuous husband. 06. Having a child (or children) with filial piety. 07. Having harmonious servants and maids. 08. Stay away from evil deeds. Translator explanations: 05. A virtuous person is person who takes refuge in the Triple Gems and upholds five Precepts of a Buddhist. He (or she) must go to a local pagoda to chant regularly every Sunday. He must read and cultivate what Buddha preached in the Sutras. He should listen to and cultivate like Buddhist monks (or nuns) preached in Dharma lectures. 08. Evil deeds are preached by Shakyamuni Buddha in the Sutras. 01. Listen to and cultivate like your Dharma teacher preach; honor or worship your Dharma teacher; respect your Dharma teacher. 02. Teach filial piety to people. 03. Respect the elders and humble with the youngers. 04. Cultivate a nature of love, morality, polite and harmony. 05. Save people who are in danger. 06. Don't be selfish and think of others. 07. For a ruler: Impose reasonable tax only. For lenders and creditors: Have small interests on borrower reasonably. For others: Know how to save money. 08. Abandon past hatreds and resentments. 07. Explanation for ruler, lenders and creditors: Extra moneys are considered stolen money and according to Buddhism: Quite no good. You should read Buddha Dharma for much more info. London is not so much a city but a state of mind. Thanks for the introductory course in Buddhism. Are you permanently based in KL now? (: You are the spitting image of your mother! Too darling. You have a really nice blogg and I enjoyed reading a lot of post from my favourit city London and some post from KL. I'm going to Malaysia (KL and Tioman) next week. We're staying av Shangri La hotel. We have made bookings at Troika and Bijan and we need more to do:) Any advice for nice restaurants/bars/shopping would be great :-) I tried to make a search on your page, but most post about restaurants etc is from London. Read your post about the tarot-reading. Could you recommend an english speaking place in KL? If you have any advice, thanks in advance and happy bday!!! For restaurants in K.L I recommend this great Malaysian food blog http://eatdrinkkl.blogspot.com. My personal favourites are Ben Yong's chains---Plan B, Ben's, Swine (you can find these three in Publika, Mont Kiara, and the first two have chains all over K.L), Wondermama and Antipodean in Bangsar, Prime (for steak) at Le Meridien K.L, and if you like bubble tea be sure to try Cha Time's new melon pearl milk tea flavour! And the 'durian smootea'! I go this fortune teller I call Madam Lulu, but she's not in K.L, it's somewhere much more obscure (even I have trouble finding the place). I don't really know/use any fortune tellers in K.L I'm afraid. Shopping; House of Eight in Publika (Mont Kiara), Pavillion (K.L), Suria KLCC (K.L), Starhill, all of Jalan Bukit Bintang really, Jalan Telawi 1,2, and 3 in Bangsar for independent boutiques, Sungei Wang for cheap, trendy, Japanese/Korean/Taiwanese fashions.